As I sit in our under-construction house, looking at dusty subfloors, hole-riddled walls (from our ongoing PEX install), and our junk on every surface (because I still haven't figured out an appropriate place for our things yet), I find it helpful to remember that we've done this before and come out on the other side. Our first major house renovation was the kitchen remodel in our last house. It was built in 1977, and was terribly outdated. 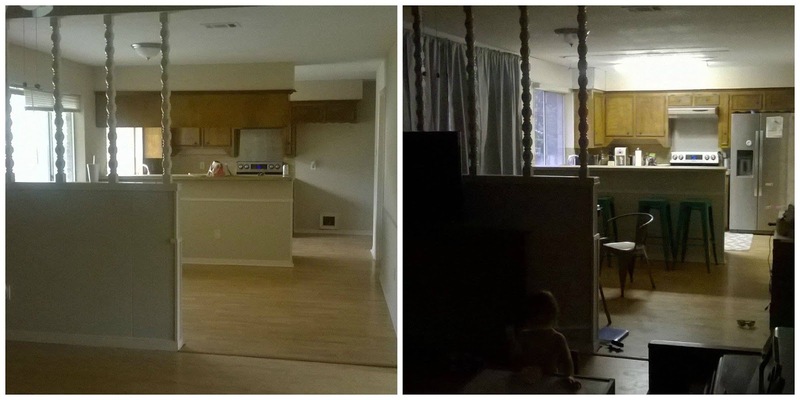 The left side was move-in day, and the right was a week later. 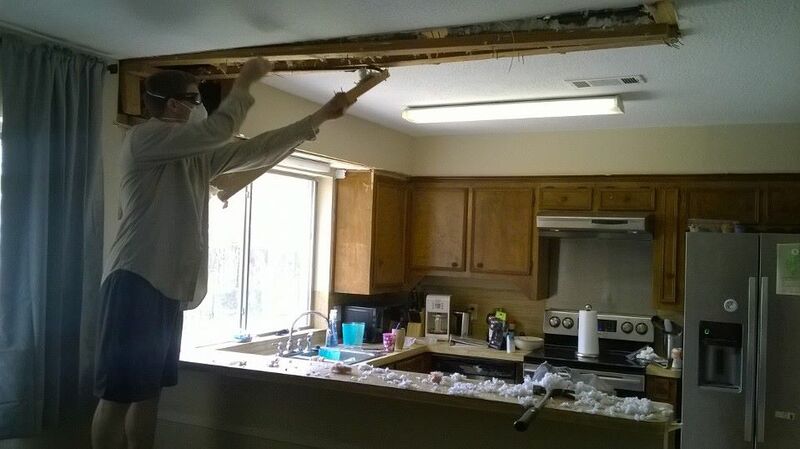 Removing the soffit was a terribly messy job. We started by removing the uppers that divided the kitchen from the breakfast room and adding temporary curtains to the large window that was turning the room into a sauna. As it turns out, we inherited a seriously undersized air conditioner, so those blackout curtains helped the temperature to stay somewhat livable while we waited for our new unit to be installed. 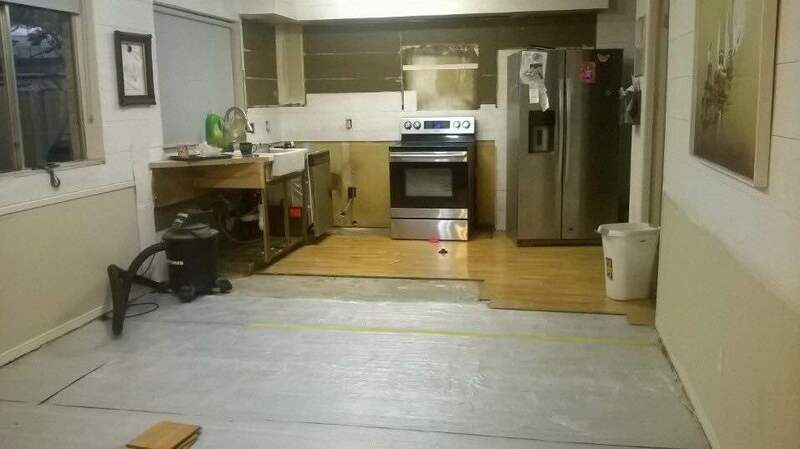 My original plan for the kitchen was to work with the original tiny layout and just paint the cabinets. 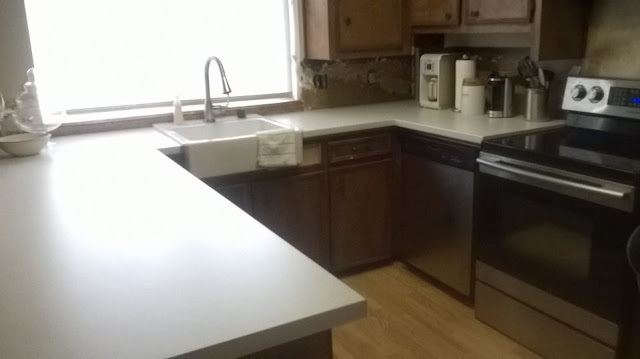 We went so far as to purchase and install a new farm sink and laminate countertops from IKEA, which turned out to be one of the most excruciatingly tedious jobs ever. Those diagonal seams were so difficult to line up perfectly! Thankfully, before I bothered painting the cabinets, I started to realize that the size of the kitchen simply wouldn't work for our family. I'm the type who needs ample personal space (I have a large bubble), so anytime anyone tried to join me in the kitchen, my stress level went straight to 98. 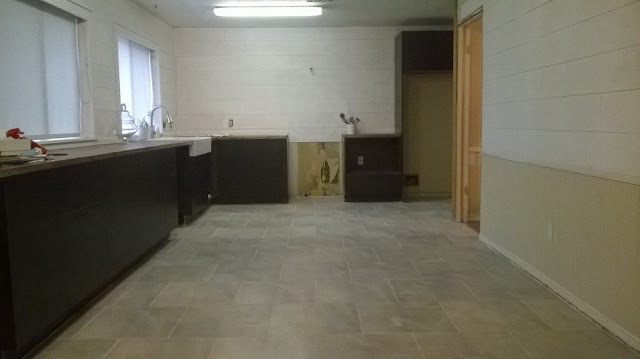 We decided to not spend any more time or money on the kitchen until we were ready for a serious remodel. Then a little thing called the Tax Day Flood happened. Our house didn't even come close to flooding, thank goodness, but a large section of our privacy fence was blown down. After renting a dumpster and putting all of the damaged fence materials into it, the dumpster was still half empty. That felt wasteful to me, so I impulsively suggested to Patrick that we fill the rest of the dumpster with our kitchen. He went for it! Before he even got home from work, I started ripping out the old laminate floors so he couldn't change his mind. 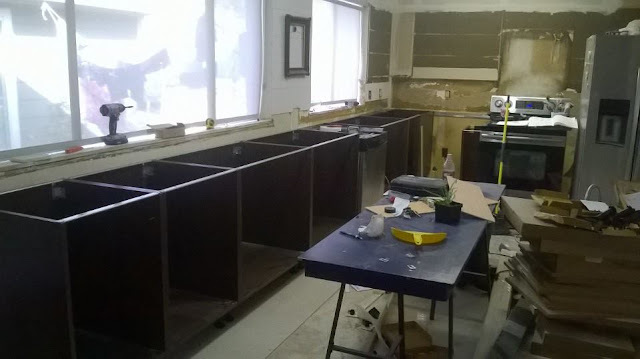 We wasted no time ripping out the old cabinets, except for the one under the sink, which we wanted to remain operable for as long as possible. Using IKEA cabinets was an easy choice. I've heard nothing but glowing reviews about their quality, and I had just followed along as Chris and Julia (from ChrisLovesJulia.com) completed their beautiful IKEA kitchen. Because zero planning or forethought went into our timeline, we were hard up for time and money. We wanted to keep the entire kitchen under $5000 (spoiler, it ended up at $6000), and we wanted to get it done in a month. Ha! Just ordering and waiting for delivery of our new cabinets took two weeks. I assembled the cabinets, and Patrick and I installed them. I would say that assembly was super easy, and installation was a 6/10 on the difficulty scale. Working with an old house that was out of plumb, level, and had no straight lines or right angles, made the job much more difficult than it's supposed to be. We selected the Tingsryd fronts, which are a black/brown (mostly black) flat front with a wood grain texture. Price was our primary consideration, and I also thought they'd look pretty with brass hardware, which was, in my opinion, a must have. Two years later, I'm still pretty smitten with the brass and black trend, although I'm sure its time in the sun is reaching an end. The new kitchen layout absorbed the old breakfast room, which created a monster sized (more than 12 feet) stretch of uninterrupted counter. 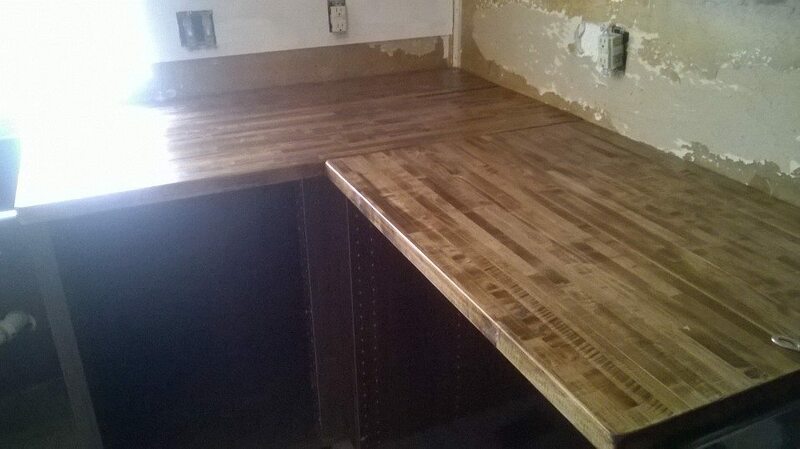 We couldn't source any prefabricated butcher block at that length, so we found a guy on Craigslist who was able to custom make them for us. We installed horizontal paneling *cough shiplap* made out of quarter inch underlayment to cover the multiple layers of painted over wallpaper. It was supposed to be easier than removing wallpaper, but it turned out to be one of the most trying times of our marriage I mean lives. It turned out cute, though! We went with open shelving in lieu of upper cabinets. I'm a convert for life! I really enjoyed the way it kept me honest with our stuff. I'm totally the person whose cabinets/fridge I don't want you to look inside, but keeping the shelves neat and tidy was automatic because they're always on display! On another whim, we used a small hidden wall between the kitchen and laundry room as a chalkboard. I used it to keep track of the girls' chores and our grocery list, and the girls enjoyed doodling at the bottom. Gosh, I miss this place. I will admit, though, that those in-progress pictures are much worse than I remembered. It gives me hope that one day soon I'll forget how messy our current situation is!